Salicylic Peel Kits | Salicylic Peels | Salicylic Acid - International Shipping. A Beta-Hydroxy Acid, is a highly effective superficial peeling agent, oil reducer and pore cleanser. Salicylic is one of the most effective ingredients to combat the cause of facial oil, breakouts and blemishes. Most popular peel for blemishes and scars. "This product has done wonders for my skin in more ways than one." "Very effective for breaking down dull skin cells and purifying the pores of oil and debris." 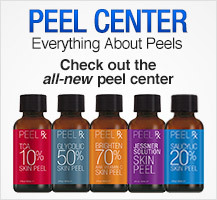 Benefits of our Salicylic Peels? Salicylic Acid, what it is and ingredients: Salicylic acid is a beta hydroxy acid, which means it contains hydrogen and oxygen atoms. This acid is crystalline, colorless and is most widely used in cosmetics as an anti-aging cream or facial cleanser for acne prone skin. Salicylic acid is usually a skin care alternative to Glycolic acid. Salicylic acid loosens and removes aging cells, oil and debris attached to the skin surface. Salicylic acid is oil-soluble and lipophilic so it penetrates sebum filled follicles and cleans out clogged pores, resulting in marked improvement in the appearance of blemish prone skin. Stimulates new healthy skin cell production and increased collagen formation. 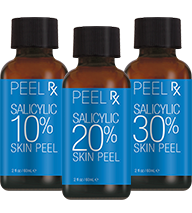 Salicylic Acid Peels can be used in your own home and are the same strength that the professionals use. These peels can be done in your home at a fraction of the cost. When used properly, salicylic acid is an excellent mild exfoliant. Salicylic acid sheds dead cells, helps diminish the appearance of marks and scars, and rejuvenates the skin. When normal skin care methods fail to clear the skin, it may be time to try a more intense product that contains salicylic acid. Salicylic doesn't just fight against existing blemishes, it also helps diminish the appearance of existing marks by peeling and removing dead skin cells that sit on the top outer layer. • Always follow individual peel instructions! Each kit includes detailed directions. • Begin with the lowest peel strength and gradually progress to an advanced concentration. • "Spot treat" a discriminate area of the face or neck to test for negative reactions. • Use broad-spectrum sunscreen particularly during extended periods of sun-exposure. As you prepare for a facial cleansing treatment, you should be aware of the ingredients in the product and how they work with the skin. A core ingredient in many cleansing products is salicylic acid, which has been shown to help target the causes of breakouts and diminish the appearance of scars. Salicylic acid is also used as a preservative in some products because of its ability to help prevent bacteria from forming. As always, take into consideration the four C's of chemical peels! Concentration: The salicylic acid peel ranges upward from 10%, 20% and 30%. Condition: The salicylic acid peel is not recommended for pregnant or nursing women. Hypersensitive skin conditions (i.e. : sunburned, dermatitis-prone or infected skin) should avoid all skin peels including salicylic acid. Otherwise, the salicylic acid peel is an excellent peel treatment for acne prone, oily, congested, hyperpigmented and photodamaged skin. Conduct: The salicylic acid peel should always be handled with care! Salicylic acid helps exfoliate dead skin cells and unclog pores that can lead to marks and impurities. Salicylic acid is also a natural ingredient that does not generally cause skin irritation when used properly. Not only is salicylic acid used to fight blemishes, it is also benefits oily, aging and sun damaged skin. Salicylic acid has the unique ability of not only opening clogged pores, but also preventing pores from clogging in the first place.